When AMD announced the new Ryzen 2000 Series processors along with the new X470 platform on April 19th, 2018 many might have missed that G.Skill released new Trident Z RGB and Sniper X DDR4 memory kits custom tailored for this platform. Clock frequencies on these kits start at DDR4-3200MHz CL16-18-18-38 and go up to DDR4-3600MHz 18-22-22-42. 32GB (4x8GB and 2x16GB) kits are available at 3200MHz only, but you can get 16GB (2x8GB) kits at 3200, 3400, 3466 and 3600 MHz. G.Skill is using an 8-layer PCB with Samsung “B” die memory ICs with part number of K4A8G085WB-BCPB. This is a popular die for many of the fastest high-speed DDR4 RAM kits on the market, so we can’t wait to really push one of these kits to the limit and see what it can do. 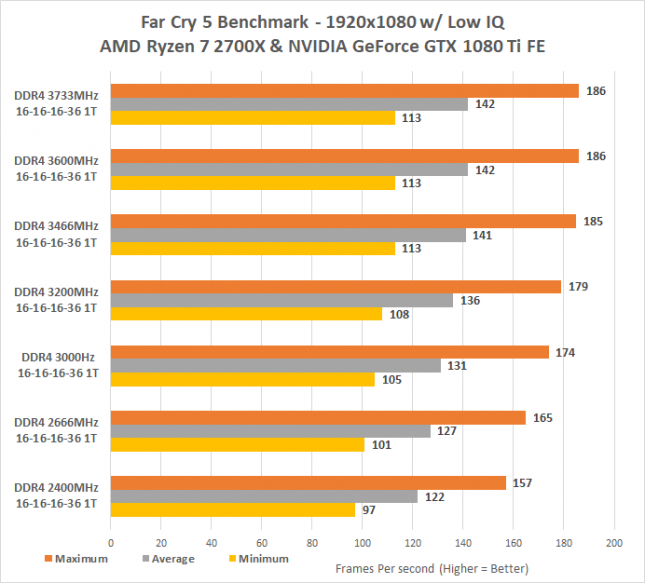 When the original Ryzen platform was released it was tough to hit 3200MHz, but AMD has really improved this platform and with the improved Integrated Memory Controller (IMC) we have learned that AMD and motherboard makers are getting up to 3800MHz stable in the test labs. We wanted to see if we could get over 3600MHz with this memory kit since they have AMD X470-specific memory specifications and push the boundaries of what one can expect from AMD AM4 system performance to the next level. We’ll be using the G.SKILL Sniper X Series 16GB (2 x 8GB) DDR4 3400 (PC4 27200) memory kit that is sold under part number F4-3400C16D-16GSXW. This part is only now becoming available to purchase as we heard that AMD bought the first batch of them to seed with the Ryzen 2000 press kits. This kit is backordered right now from Newegg for $237.99 plus $0.99 for shipping. 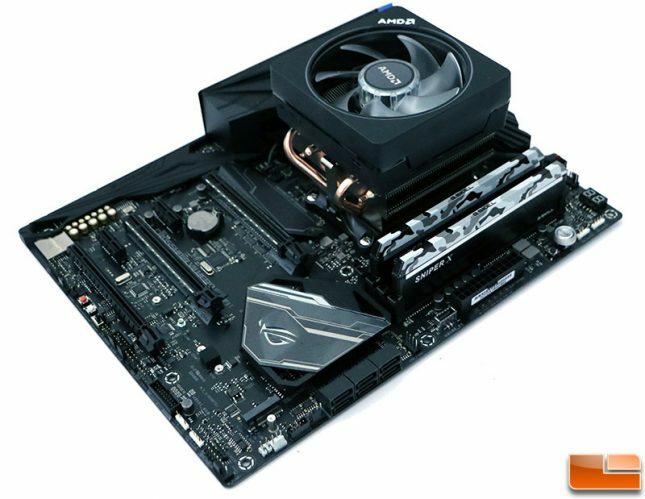 We’ll be testing it on the ASUS ROG Crosshair VII Hero (WiFi) motherboard with the AMD Wraith Prism CPU Cooler on Windows 10 64-bit. We loaded up beta UEFI 0601 on the ASUS ROG Crosshair VII Hero (WiFi) motherboard and tested using the memory kits stock timings of 16-16-16-36 with a command rate of 1T. We started out testing at 2400MHz and finally topped out at 3600MHz using the stock voltage of 1.35V. When we manually increased the voltage to 1.45V we were able to push the kit up to 3733MHz with full stability. We didn’t tweak any of the advanced memory settings or increase the SoC voltage to get DDR4 3733MHz stable. 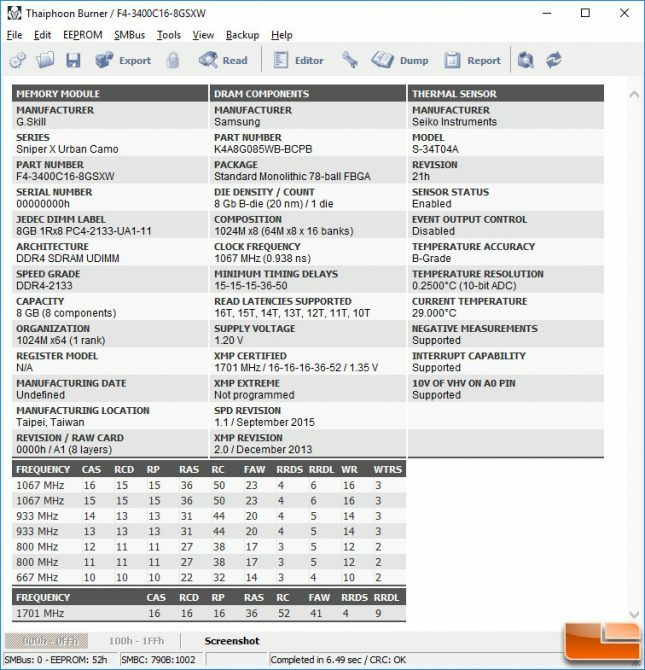 We tried to get 3800MHz stable and could not with these settings. We tried using the Ryzen DRAM Calculator 1.1.0 Beta 2 to help with overclocking and our kit wasn’t having it even after loosening the timings and going crazy on DRAM and SoC voltages. Using the Cache & Memory Benchmark in AIDA64 v5.97 we are able to see the memory read and write bandwidth scale nicely as we move from 2400 MHz all the way up to 3733 MHz with the AMD Ryzen 7 2700X processor at stock speeds on the ASUS ROG Crosshair VII Hero WiFi Motherboard ($299.99 shipped). The only difference here is clock speeds as the timings are exactly the same on each memory kit. Read memory bandwidth went from around 37000 MB/s with DDR4 2400MHz all the way up to nearly 54000 MB/s at DDR4 3733MHz, which is an increase of around 46%. 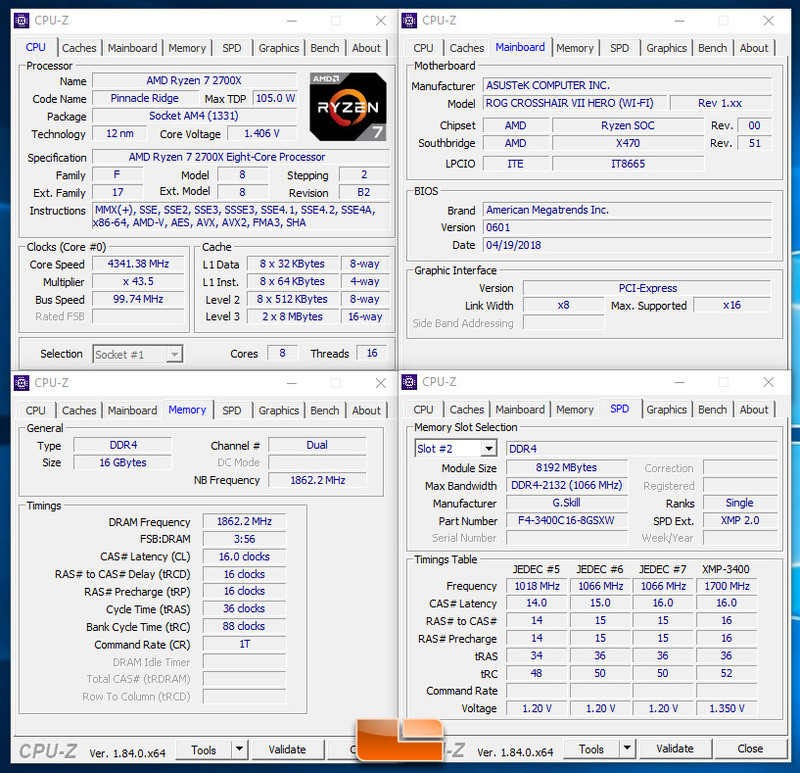 Memory latency started out at 81.0ns on at DDR4 2400MHz and dropped down to 63.3ns at DDR4 3733MHz. We saw some nice drops up to 3466MHz, but moving up to 3600MHz and then 3733MHz didn’t drop the latency much. 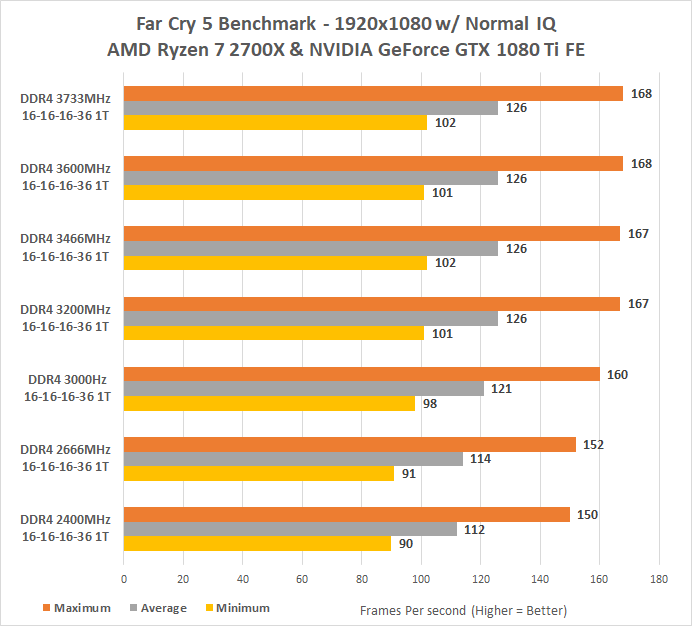 We took a quick look at gaming performance with the built-in benchmark in Far Cry 5 and discovered some nice performance scaling at 1920 x 1080 with low image quality settings on a GeForce GTX 1080 Ti FE graphics card. With a 2400MHz memory kit we averaged 122 FPS and this improved up to 136 FPS with a 3200MHz memory kit. 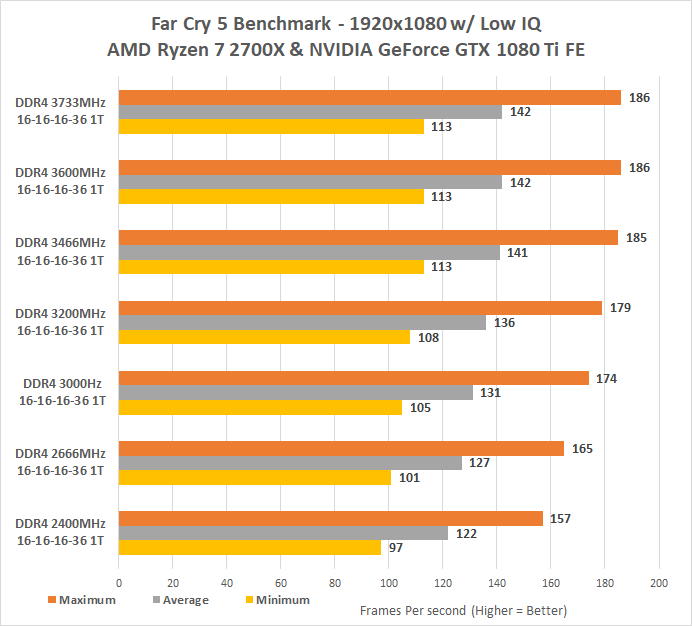 This is a nice 11.5% performance increase. It looks like we started to become GPU bound or bottlenecked by something at around 3466MHz as the GPU performance pretty much plateaued. We still noticed a 16% performance improvement between the 2400MHz memory kit and a 3600MHz memory kit, so that is nice to see. When we increased the image quality to normal we were able to get a 12.5% bump in performance when starting out with a 2400MHz and moving up to 3200MHz. Over 3200MHz the average FPS didn’t change as once again we were being bottlenecked by what appears to be the GPU. 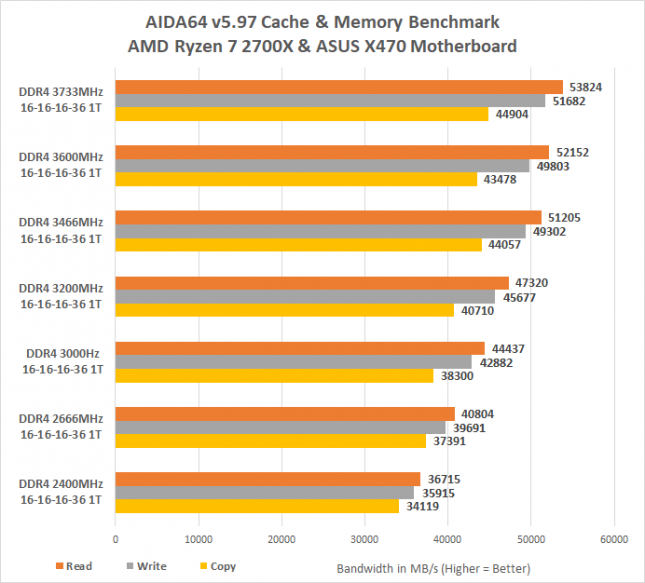 Our quick look at DDR4 memory scaling on the AMD Ryzen 7 2700X 8-core, 16-thread processor on the AMD X470 platform with a G.Skill Sniper X DDR4-3400 memory kit was pretty fun. We were able to push this 3400MHz kit up to 3733MHz with the stock timings of CL16-16-16-36 by just bumping up the DRAM voltage. We were never able to get this high on the Ryzen 1000 series on the AMD X370 chipset, so the Ryzen 2000 series is allowing AMD to get higher DDR4 clock speeds than before. For a hot second it looked like we could get 3800MHz up and running, but we had to throw in the towel for the time being. 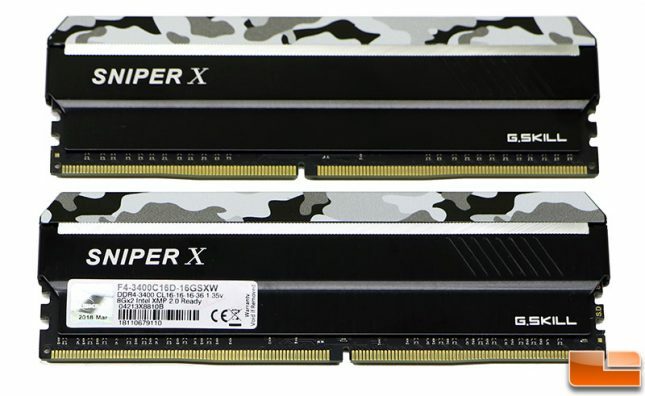 The G.Skill Sniper X DDR4-3400 CL16 memory kit that we used today is $237.99 plus shipping and will allow you to get the best performance out of your Ryzen 1000 series or Ryzen 2000 series processor on both AMD X370 and X470 motherboards. 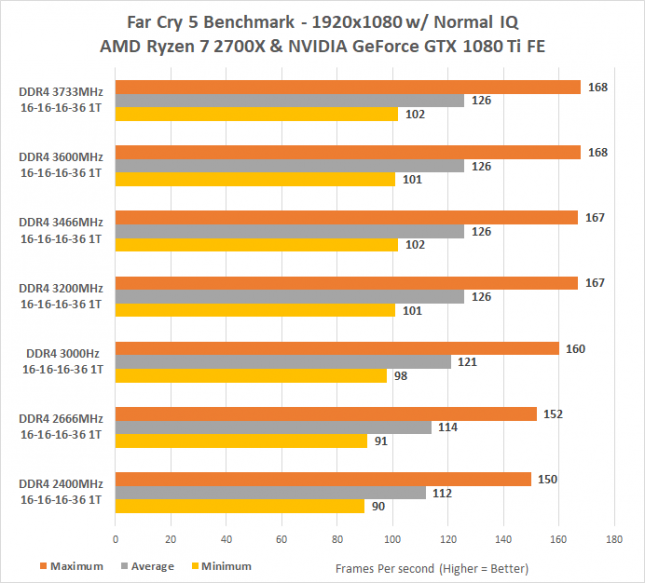 After looking at DDR4 performance scaling we can safely say that we aren’t leaving any gaming performance on the table due to the memory kit. 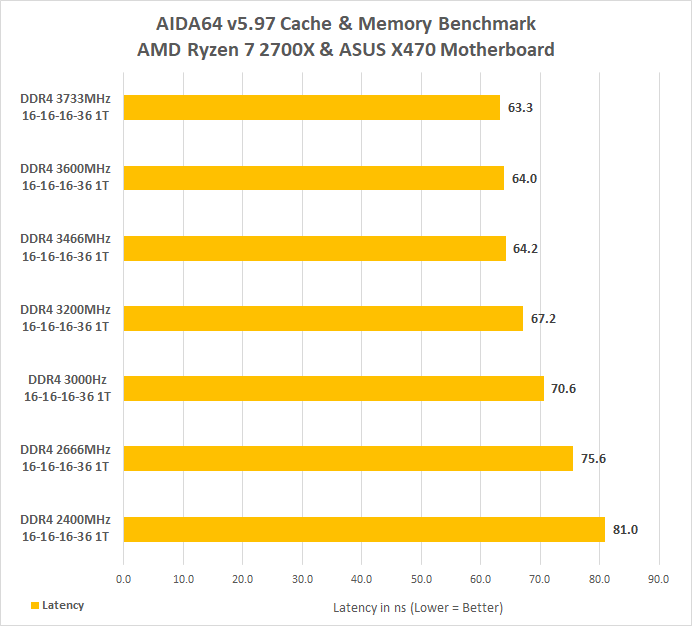 It should be noted that the memory timings here could have been easily tightened for more performance, but we wanted to keep things simple by showing DDR4 scaling at the same timings. 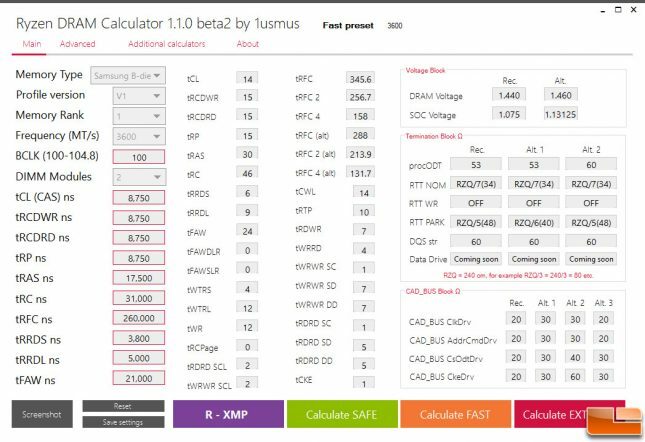 If you enjoy overclocking and own an AMD Ryzen platform we highly advise downloading the Ryzen DRAM Calculator and trying it out to get the most performance from your memory kit. It gives you safe/fast/extreme suggestions for the clock frequency you want to hit. It shows you dozens of advanced memory settings after you manually enter in a few key data points and read the XMP profile of the memory kit you have. It also gives you suggestions on voltages and termination block settings! 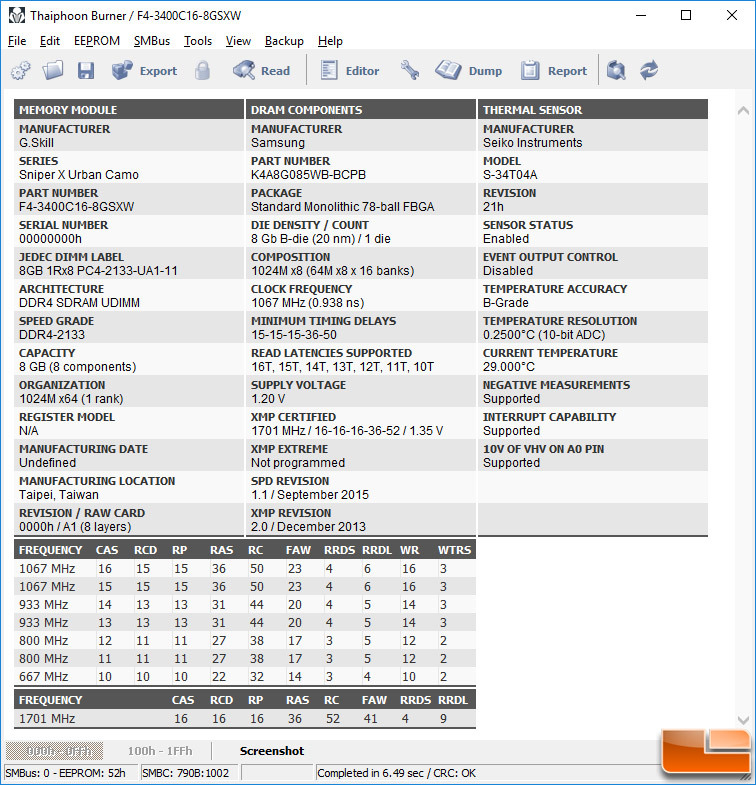 This memory tool is the best that we have ever seen and is an enthusiasts dream. It’s not made by AMD, but we’ve seen it used by them! The Thaiphoon Burner image above is for the memory aficionados that may want to see the specifics of this kits SPD content. If you guys/gals want us to change to a faster kit of memory please let us know in the comment section as we’ll spend more time on memory articles if there is an interest.